Social networking sites come with tremendous potential for businesses to enhance their traffic, leads and sales. However, if not used in the right way, then it can even ruin the reputation of your business. In today's article we are going to tell you about 7 common social media mistakes which could ruin your brand's reputation. Even if you are posting engaging content, you need to be careful about the amount of content being posted per day. No matter how appealing your content might be, posting too much is never advisable. Posting excessive content on a daily basis is like flooding your viewers with a lot more information than they really need. Social media postings when overdone can leave your audience feeling exhausted and annoyed. What you should do instead is, post relevant information in measured doses. Never overstate your claims and do the advertising in a subtle and innovative way. Posting similar kind of content regularly or posting stale articles would bore your audience and prompt many of them to click the un-follow button. Make your page interesting by posting content on many different subjects. There are businesses which start a social media page and post only one article per week. If you are inactive on your social media, then your audience would lose interest very soon. Remember that your audience isn't going to share info about your brand unless you properly engage them with a regular flow of quality content. If there is no new input on your part then your audience isn't going to be your followers for long. No matter if you are sharing photos, videos, memes or articles, you need to focus on topics which are relevant and enjoyable. If your audience attempts to reach out to you by posting a question or comment, then the first thing you need to do is reply to them. In case you fail to respond on time, then you are in big trouble. Such irresponsible behaviour would make your audience feel ignored and it wouldn't take much time for them to un-follow you. Moreover, they might even go to your website and write a negative review. Keep in mind that social media is one of the best channels for providing excellent customer service so ensure that you are responsive and helpful to your audience. Your audience is looking forward to interact with real entrepreneurs, not with bots and machines. Therefore communicating with them in a dry and formal manner is only going to turn them off. Never address them formally and use their name instead. Keeping a casual and informal tone in the conversations will help to add a personal touch. If your site is graphically oriented then consider using Pinterest, Instagram and even Facebook. However, if your site is more article oriented then you should be spending more time on LinkedIn and Twitter. Target the social networking sites which allow you to yield the highest ROIs for you. Instead of using all social networks at once, you need to choose just one or two and focus on them. 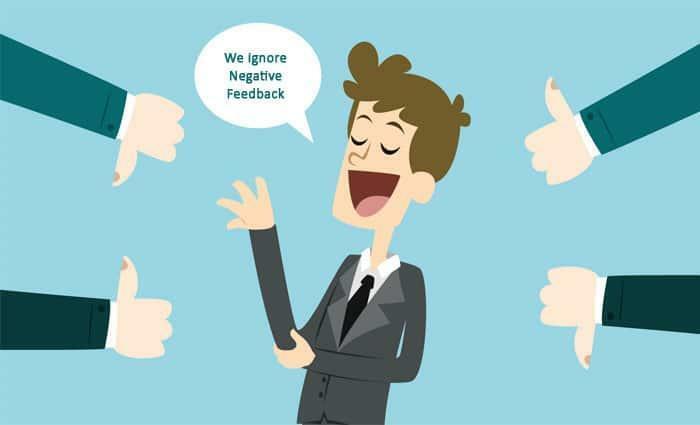 Rather than avoiding negative feedback you should view them as an opportunity for rectification. By promptly responding to the negative comments you'll be able to show your commitment towards top notch client servicing. Always hire a professional writer to write the content for you, rather than going for a DIY approach. Fluff content, plagiarized writing and bad grammar are three things which can definitely ruin the reputation of your brand. If you want to post on your social media page on a regular basis, then make sure to get your articles written by a professional content writer. Contentmart.com is one of the best platforms from where you can hire professional freelance writers to help you produce the content. While getting the same job done by an SEO company is going to cost you a fortune, you can get quality content written at a very cost effective rate by hiring a writer from contentmart.com. They have thousands of writers who regularly bid on content orders posted by clients from all over the world. You don't need to shell out a buck for creating your account on Contentmart. Once you post your job, lots of proficient freelancers are going to bid on your project. You can hire the best writer by taking a look at their reviews and ratings from other clients. Checking out the portfolio of the writers is also a great way of assessing their writing standard. If you are not happy with the article, then you can ask your writer to make the required changes before releasing the funds. If it is quality content you are after, then make sure to check out contentmart.com. Social media is a place where lot of information can be exchanged informally. Only thing is we should be clear what the other person or client is asking or intending. This clarity is required for delivering a relevant answer or remedy. A good reputation in social media will be a boon for long term positive relationship yielding adequate gains for a company or person whatever case it may be.